Disappointingly, hyqueous is not a real word, although it might as well be something Gary Gygax dug up from a thesaurus. 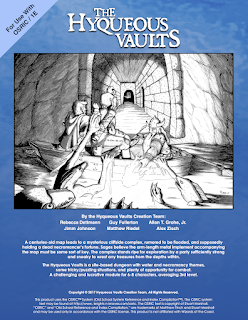 The Hyqueous Vaults, a collaborative dungeon published in honour of OSRIC’s tenth anniversary, also has some of that gygaxian touch. Based on an unkeyed one-level dungeon map describing a half-flooded complex, it was developed in a forum thread, then edited for release. It is currently available as a free download, and an inexpensive POD version is forthcoming. Minor spoilers follow. The dungeon packs an impressive amount of content into 18 pages: 67 keyed areas, new monsters and magic items, and a very useful one-page monster roster. This density is mainly accomplished by the module’s economy of text, which relies on sentence fragments to sketch up ideas in a small amount of space. This approach requires a good command of language and an eye for understanding what matters and what doesn’t – and here, the method works rather well. “Smashed-open door. Broken four poster bed. Open wardrobe with musty tunics, pants and robes” describes a ruined bedchamber; “Smoky odor. Fishing net draped over four long, creaky, nailed-shut crates in the west; each contains six long swords in oilskin” sets up an antechamber used by the dungeon denizens. This is a nice base to work from; details are added where there is a need for them, and the level of detail is appropriate through the text. This works as a reference document as well as a key to a mysterious and fascinating place. The dungeon is built on a decent combination of exploration, combat and puzzle-solving, more fantastic than strictly realistic, but well connected to the dungeon’s theme. There are multiple situations where good tactics can make a big difference, and several spots where a little out-of-the-box thinking (the oft-misunderstood and maligned player skill) can prevent unpleasant consequences or save the day. I was impressed by the way the dungeon hides some things in plain sight, or where a place hides more than meets the eye. This is where standard dungeon exploration routines won’t help, but paying attention and interpreting cues will be successful. (However, there were a few spots featuring pixel-bitching of the “Ha-ha! You didn’t care to investigate the underside of the aquarium!” sort). 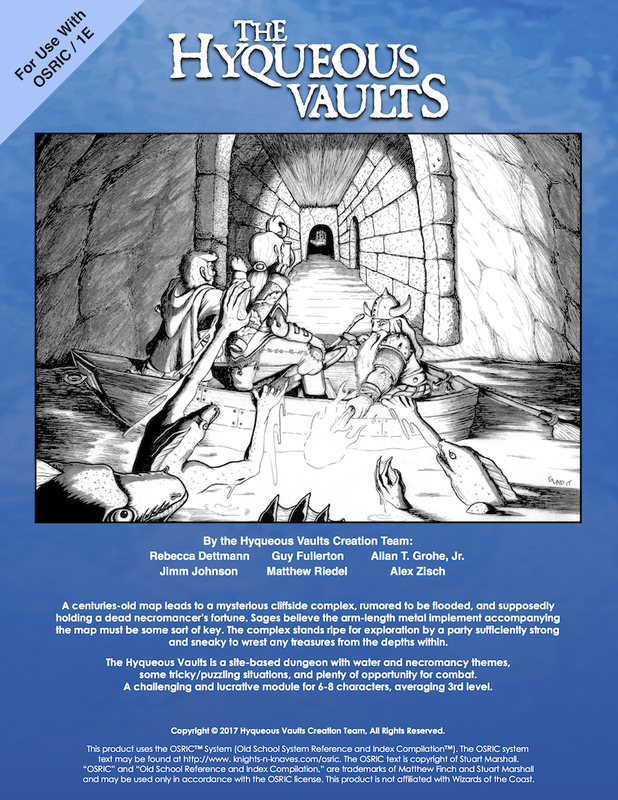 The Hyqueous Vaults also features two major power groups in the dungeon, one involving a tricky NPC who can be both an ally and a dangerous opponent (usually both), and a second involving a new race of monsters. Like all of the module’s new monsters, these little underground fellows are original and a good addition to D&D. There are also other memorable encounters, including a scary-as-hell hydra lair, a sphinx, and some truly ‘hyqueous’ horrors. There are also some nice treasure hoards – sometimes right out in plain sight – except they are not always easy to remove from the dungeon until you learn how. If I could level criticism at the module, I would mention two minor, but noticeable flaws. First, the balance of encounters, while overall good, is heavily weighted towards ‘specials’. This is generally fine, but it is likely that some groups will not find the majority of them. They are not just on the obscure side, hidden behind clever secrets, they also take up a good share of the dungeon’s contents. For all its 67 keyed areas, I was overcome with the feeling the module was too short for its own good – that it needed to have more basic encounters for a balanced adventure. The second issue is related to the first. While the two key power groups are both intriguing, and they are suitably different, the second seems to be underrepresented in the actual dungeon key, and outside one spot, are mostly seen as random encounters. This is an odd decision, although easy to remedy. To sum up, this is a very neat scenario, one of the top dungeons this year. It is, in a sense, also a follow-up to the high standards set by Pod-Caverns of the Sinister Shroom, both in the module’s ideas and its execution. It will be well worth owning in print. The adventure has been extensively playtested, and the testers are listed in the credits. Just a short thank you note for these reviews. Until now, even tho I reading them all, I never made a comment - sry about this. Thanks, much appreciated! Good to know people are reading them. There is more to come, but I hit a phase where writing didn't come easy. I also missed some modules I encountered because they were bad in a very predictable, boring way, and some because they needed a better review than I could provide at the time. Thank you for the review, Gabor, and Happy New Year! Happy new year, Kent! Play more, drink less!